Well, we saw our first snow this morning and they say more to come tonight. I guess it really is November. The months have just been slipping by and our Journey to Hawaii is getting closer. We started planning this group and were amazed to have both Kimo Hussey and Roy Sakuma agree to join us. Today I have some more news to share. As you know, we promised you two Rising Star Artists who will be spending time with our group in Hawaii. A few minutes ago I just got confirmation of the first Rising Star Artist who is signed on to our group. Corey has just returned from his tour in Taiwan and is an amazing Ukulele Artist. We are absolutely thrilled and hope you will be too. His complete bio will be forwarded to you as soon as I receive it but I just had to share this. And you can check out Corey online. Aloha! Let’s set sail on a group tour of Oahu! 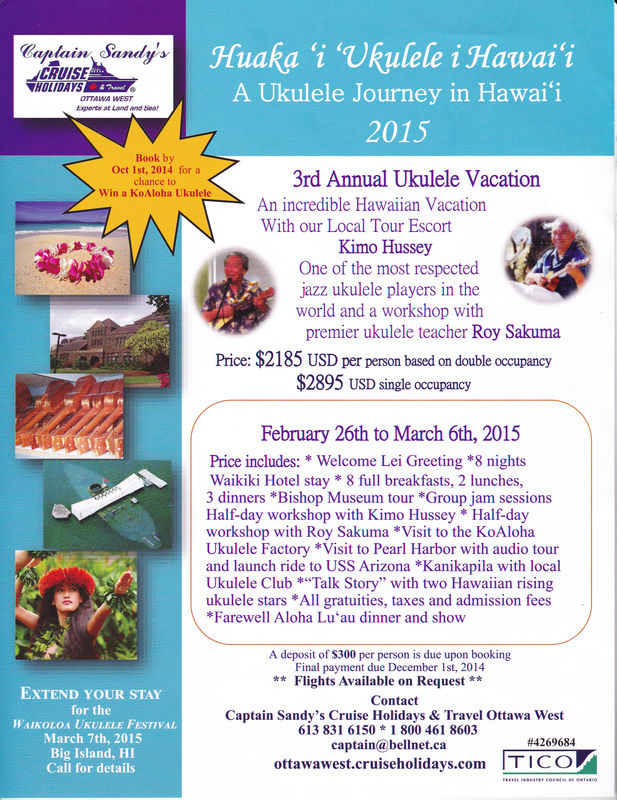 This Ukulele Journey in Hawaii Tour is offered through the Ottawa-area based Captain Sandy’s Holiday Cruise Holidays & Ottawa Travel West on February 26 to March 6 2015. The price includes accommodation, a tour of Pearl Harbour, a tour of the KoAloha ukulele factory, meet-ups with ukulele musicians, local ukulele clubs, kanikapila, a luau, several lunches and dinners and 2 half-day ukulele workshops with famous ukulele instructors – Kimo Hussey and Roy Sakuma Jr.
All you have to do is contact Donna Curtis at Captain Sandy’s travel agency, and put down the $300 deposit. The rest is due on December the 1st. Don’t have a travel companion? Just ask Donna when you book the tour about sharing accommodations with someone from her “share list”. You might make a great friend who automatically shares similar interests with you – playing the uke! We will be staying at the beautiful Waikiki Beach Resort on Koa Avenue, one block from Waikiki beach and Kalakaua Avenue in Honolulu. The Resort is within walking distance of the International Marketplace on Kalakaua, the Waikiki Town Center on Kuhio, and the famed Kapiolani Park, the Honolulu Zoo and the Waikiki Aquarium. There is also an option to extend the tour and attend the 15th Annual Waikoloa Ukulele Festival being held on the Big Island of Hawaii on March 7th. The festival takes place at the beautiful beach front Waikoloa Beach Resort, where you will also have accommodations! Lastly, I leave you with links to Kimo Hussey and Roy Sakuma.